What you see below is the *Blue Print* or design of the human body. Our Bodies are designed to be the same on both sides. The left and right side doing the same thing. 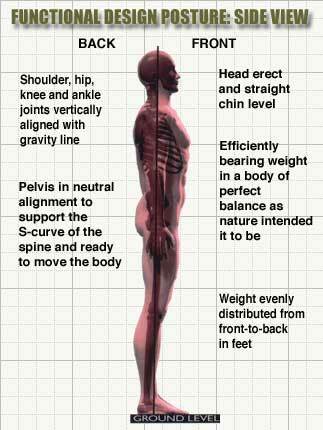 The muscles on the front and back of the body being in balance too. If you will notice the vertical and horizontal lines form 90 Degree angles whenthey line up correctly. Your weight should be evenly distributed over both feet. The closer we get to the *Blue Print* the more we can move with ease. Women are the same except they have a wider pelvis. This restores proper Function which now allows for "Pain Free" enjoyable movement leading to better performance. Yes! No matter what your age. You can quickly improve your quality of living. "Once you have DECIDEed".. You are going to make the change, ..That "You can make the change". and you will follow thru using a solid plan of action to take you where you want to go. Pay attention to your Postural Balance and watch how things begin to change for the better. We are here to help and would love to hear from you. Join the Pain Free Revolution today! 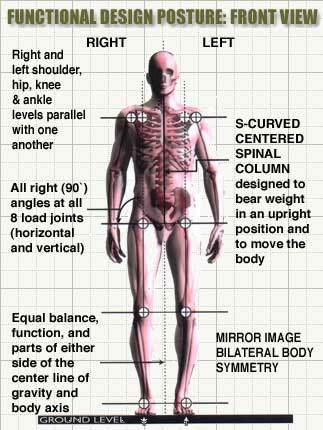 Now we know what our Postural Alignment should looks like, it is time to see how You compare. Is your weight really evenly distributed? Or is it in one or both heels, in the front of one or both feet? Is one shoulder or hip higher than the other? Do you feel twisted? All these things are symptoms of Postural Imbalances that can be restored with Simple Corrective Exercises that can return your body back to it's original Functional, Pain Free design. Let's end this needless suffering. Check this stuff out and then ...Let get to work! It will work if YOU do..